In this article, we are discussing the Bar Graphs in a manner which is comparatively lucid. Don’t worry, the rest of the types we will cover in the upcoming articles. If you want to fully understand the techniques, you will have to pay attention to each and everything that’s been taught here. 1. Trends can be easily established as compared to tables and pie-charts. 1. Less accurate than tables as at times, especially when the grid lines of the graph are missing because of which exact value of the bar cannot be accurately established. 2. Comparative type questions can be easily solved by visual inspection of graph. 2. The graph may get a little complicated in case of multiple bar chart or stacked bar chart. 1. In comparison based questions use the lengths of the bar and not exact values to solve the questions visually. Here is a CAT 2003 (Feb) DI set to illustrate the same. It is clear that to solve the above question we need to look at the second graph. However, rather than struggling to get the exact values and then spending more time diving them to get the answer, we can do better by solving the question visually. The question boils down to diving the un-shaded bars by the shaded ones and find out for which year would this value be the highest. For a fraction to be the highest, its numerator should be as high as possible and the denominator should be as low as possible. In other words, the un-shaded bar should be as long as possible and the shaded bar should be as short as possible. This is clearly seen for the year 1995. 2. Use the grid lines effectively for quick calculations. Let us solve this CAT 1996 question to understand the same. One way to solve the above question is to add up the exact values and get the answer. The other way is to establish every value of the Revenue in terms of ‘Gridlines’. For example, in 1991, the value of Revenue corresponds to 5.75 gridlines. Similarly for 1992 it is 6.5, for 1993 it is 7.5, for 1994 it is 8 and for 1995 it is 8.75. If we were to add all, we get a value equivalent to 36.5 gridlines. Since we know every gridline corresponds to a value of 25 lakhs, every 4 gridlines would correspond to a value of 100 lakhs or 36 gridlines would correspond to a value of 900 lakhs. Plus another 0.5 grid lines corresponds to 12.5 lakhs. Thus the total revenue for the given 5 years is 912.5 lakhs. This method helps you to deal with single-digit or two-digit values and hence enhance your calculation speed. Along the X-axis (horizontal axis) we have some numbers. Along the Y-axis (vertical axis) we have some other numbers. And in between the area, we have some Bars. Try to understand the data that’s been presented here. Finding it a bit difficult? Of course it’s difficult because you don’t know what these bars represents. Now, try to understand the same bar chart, but with the headings. Three different bars represent three different games: Football, Cricket, and Badminton. On the X-axis, we have a number of countries from 1 to 6. On the Y-axis we have the number of players. The length of the Bars denotes the number of players. CONCEPT 1: Before you solve any of the questions, first you have to understand what the Bar Graph is trying to say. Make a habit of scanning the headings first. You have to understand what’s on the X-axis, what’s on the Y-axis, what’s the relation between these two in terms of the length of Bars.There will be five questions based on one Bar Graph and that means you can get five full marks if and only if you understand the format of data that’s presented in the question. That’s what Data Interpretation actually means!! Let’s proceed to solving five questions based upon this Bar Graph. Question 1: The number of players participating in Cricket from country–4 is what percentage of the number of players participating in Badminton from country–1? CONCEPT 2: From this question we conclude that: data in Bar Graph tell us so many things. But it’s pointless to waste time interpreting all the data. It’s not necessary to know how many Football players or Badminton players are from Country-4 or from Country-6. Interpret what’s necessary! Just point out Cricket players from Country-4 = 80 players. Number of Badminton players from Country-1 = 45 players. The rest is just the application of percentage formula. Question 2: What is the total number of players participating in Cricket from country 4, 5 and 6 and the number of players participating in Football from country 1, 2 and 3? Applying Lesson number two, Number of Cricket players from Country 4, 5 and 6 = [80 + 70 + 60] = 210. Number of Football players from Country 1, 2 and 3 = [65 + 70 + 90] = 225. Question 3: The number of players participating in Badminton from all the country is what percentage of the total number of players participating in all the games from country–3? Question 4: In which country is the number of players participating in Football is the highest and the number of players participating in Badminton is the lowest? CONCEPT 3: These sort of questions are pretty easy to solve. Just interpret the data in your mind. Check the length of the Bars. The answer will surely come. Question 5: 60% of players participating in all game from country-5 are male and 30% players participating in all game from country-3 are female. What will be their ratio? Number of players from all games of Country-3: we already have calculated this number before in Question 3. CONCEPT 4: Sometimes the calculation of one questions helps in the calculation of some other question. “Before anything else, practice is the key to success”. You should practice as much as you can. The only key to success is to solve the question in given time and earlier than the others. This will help you solve tough questions with determination. Firstly, you build your basics concepts and the practice will give you the edge and enable you to just scan the data and give the answer. You need to practice quality questions matching the difficulty level of the exam. Example: Questions on Bar Graph and Line Graph from Data Interpretation for IBPS PO and SSC CGL. Question 1: Approximately, what is the average population of state A for all the given years? Therefore, The approx average population of State A is 58% – option 4. Question 2: What is the ratio of the total population of state A for the years 2001, 2002 and 2003 together to the population of state B for 2005,2006 and 2007 together. *Tip – We need to find ratios. Question 3: What is the percentage rise in population of state B from the year 2003 to 2004? Therefore, there has been a rise in 16.66% of population during the year 2003 and 2004 in State B. Question 4: What is the difference in the total population of State A and total population for State B for all the years. As we need to find the total difference in the population of State A and State B, we can individually take the difference for each year and add all the differences to find the difference between total population of State A and State B. Total A – Total B = Difference(First year) , Difference(Second year) Difference(Third year) , Difference( Fourth year) , Difference(Fifth year) , Difference(Sixth year) , Difference(Seventh year). Therefore, The difference in their population is 80 lakhs. Question 5:For which state and in which year , the percent rise in population from the previous year was the highest. By using the formula, find out the percentage rise in population for both states respective to all the years and select the correct option. 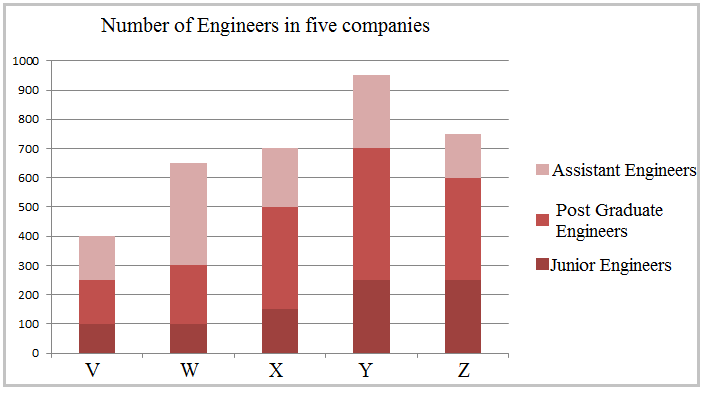 In the following bar diagram the number of engineers employed in various companies has been given. Study the bar diagram carefully to answer the questions. If the number of all the engineers in the company V, company X and companyY be increased by 30%, 35% and 40% respectively, what will be the overall percentage increase in the number of all engineers of all the companies taken together? What is the average number of junior engineers employed in all the companies? If the number of assistant engineers employed in all the companies be increased by 37% and the number of post graduate engineers employed in all the companies be decreased by 20% by what per cent will the number of assistant engineers be less than that of post graduate engineers? What is the ratio between the number of assistant engineers employed in company V and company X ? What is the difference between the average number of junior engineers and assistant engineers taking all the companies together? What was the respective ratio between the number of students who qualified in the exam from school- P in the year 2005 and the number of students who qualified in the exam from school-Q in the year 2008? Total number of students who qualified in the exam from school –P over all the years together was approximately what percentage of total number of students who qualified in the exam from both the schools together in the years 2006 and 2007 together? If 40% of the total students who qualified in the exam from both the schools together over all the years are females, then what was the total number of males who qualified in the exam over all the years from both the schools together? of students from school-Q who qualified in exam over all the years together? What was the approximate per cent increase in the number of students who qualified in the exam from school – Q in the year 2007 as compared to the previous year ? The bar graph given below shows the sales of books (in thousand number) from six branches of a publishing company during two consecutive years 2000 and 2001. Sales of Books (in thousand numbers) from Six Branches – B1, B2, B3, B4, B5 and B6 of a publishing Company in 2000 and 2001. 1. What is the ratio of the total sales of branch B2 for both years to the total sales of branch B4 for both years? Required ratio = (75 + 65) = 140 = 7 . 2. Total sales of branch B6 for both the years is what percent of the total sales of branches B3 for both the years? 3. What percent of the average sales of branches B1, B2 and B3 in 2001 is the average sales of branches B1, B3 and B6 in 2000? = 1 x (80 + 95 + 70) = 245 . = 1 x (105 + 65 + 110) = 280 . Required percentage = 245/3 x 100 % = 245 x 100 % = 87.5%. 4. What is the average sales of all the branches (in thousand numbers) for the year 2000? 5. Total sales of branches B1, B3 and B5 together for both the years (in thousand numbers) is? The bar graph given below shows the foreign exchange reserves of a country (in million US $) from 1991 – 1992 to 1998 – 1999. 1. The ratio of the number of years, in which the foreign exchange reserves are above the average reserves, to those in which the reserves are below the average reserves is? Average foreign exchange reserves over the given period = 3480 million US $. The country had reserves above 3480 million US $ during the years 1992-93, 1996-97 and 1997-98, i.e., for 3 years and below 3480 million US $ during the years 1991-92, 1993-94, 1994-95, 1995-56 and 1998-99 i.e., for 5 years. Hence, required ratio = 3 : 5. 2. The foreign exchange reserves in 1997-98 was how many times that in 1994-95? Required ratio = 5040 = 1.5. 3. For which year, the percent increase of foreign exchange reserves over the previous year, is the highest? There is an increase in foreign exchange reserves during the years 1992 – 1993, 1994 – 1995, 1996 – 1997, 1997 – 1998 as compared to previous year (as shown by bar-graph). For 1992 – 1993 = (3720 – 2640) x 100 % = 40.91%. For 1994 – 1995 = (3360 – 2520) x 100 % = 33.33%. For 1996 – 1997 = (4320 – 3120) x 100 % = 38.46%. For 1997 – 1998 = (5040 – 4320) x 100 % = 16.67%. Clearly, the percentage increase over previous year is highest for 1992 – 1993. 4. The foreign exchange reserves in 1996-97 were approximately what percent of the average foreign exchange reserves over the period under review? = 3480 million US $. Foreign exchange reserves in 1996 – 1997 = 4320 million US $. Required percentage = 4320 x 100 % = 124.14% 125%. 5. What was the percentage increase in the foreign exchange reserves in 1997-98 over 1993-94? Foreign exchange reserves in 1997 – 1998 = 5040 million US $. Foreign exchange reserves in 1993 – 1994 = 2520 million US $. Increase = (5040 – 2520) = 2520 US $. Percentage Increase = 2520 x 100 % = 100%. The bar graph given below shows the data of the production of paper (in lakh tonnes) by three different companies X, Y and Z over the years. Production of Paper (in lakh tonnes) by Three Companies X, Y and Z over the Years. 1. For which of the following years, the percentage rise/fall in production from the previous year is the maximum for Company Y? For 1997 = (35 – 25) x 100 % = 40%. For 1998 = (35 – 35) x 100 % = 0%. For 1999 = (40 – 35) x 100 % = 14.29%. For 2000 = (50 – 40) x 100 % = 25%. Hence, the maximum percentage rise/fall in the production of Company Y is for 1997. 2. What is the ratio of the average production of Company X in the period 1998-2000 to the average production of Company Y in the same period? = 1 x (25 + 50 + 40) = 115 lakh tons. = 1 x (35 + 40 + 50) = 125 lakh tons. = 115 = 23 . 3. The average production for five years was maximum for which company? For Company X = 1 x (30 + 45 + 25 + 50 + 40) = 190 = 38. For Company Y = 1 x (25 + 35 + 35 + 40 + 50) = 185 = 37. For Company Z = 1 x (35 + 40 + 45 + 35 + 35) = 190 = 38. Average production of five years is maximum for both the Companies X and Z. 4. In which year was the percentage of production of Company Z to the production of Company Y the maximum? For 1996 = 35 x 100 % = 140%. For 1997 = 40 x 100 % = 114.29%. For 1998 = 45 x 100 % = 128.57%. For 1999 = 35 x 100 % = 87.5%. For 2000 = 35 x 100 % = 70%. Clearly, this percentage is highest for 1996. 5. What is the percentage increase in the production of Company Y from 1996 to 1999?